The distinguishing feature of eukaryotic cells is the segregation of ribonucleic acid (RNA) synthesis and deoxyribonucleic acid (DNA) replication in the nucleus , keeping it separate from the cytoplasmic machinery for protein synthesis. As a consequence, messenger RNAs, ribosomal RNAs, transfer RNAs, and all cytoplasmic RNAs of nuclear origin must be transported from their site of synthesis in the nucleus to their final cytoplasmic destinations. Conversely, all nuclear proteins must be imported from the cytoplasm into the nucleus. 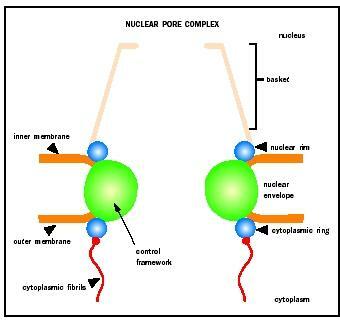 Traffic of macromolecules between the nucleus and cytoplasm occurs through nuclear pore complexes (NPCs). NPCs are large proteinaceous structures that form aqueous channels across the nuclear envelope or membrane. NPCs are composed of multiple copies of up to about fifty proteins termed nucleoporins and consist of three structural units. A ringlike central framework surrounding the central channel of the pore is sandwiched between two peripheral structures: the cytoplasmic ring from which eight cytoplasmic fibrils emanate, and the nuclear rim that anchors the nuclear basket. The structure of the nuclear pore complex. rounds of transport. According to this model, an export receptor (R) binds its substrate (S) in the nucleus and carries it through the NPC into the cytoplasm. On the cytoplasmic side, the exported cargo is released and the receptor returns to the nucleus without the cargo. Conversely, an import receptor binds its import cargo in the cytoplasm and releases it in the nucleus. The vast majority of nuclear transport receptors are members of a large family of proteins that exhibit a high affinity for a small GTPase, called Ran, in the GTP bound form. GTP (guanosine triphosphate) is an energy-carrying molecule used in cell signaling. A GTPase like Ran can cause GTP to become GDP (guanosine diphosphate), which will change the properties of the GTPase. The GTPase Ran regulates the interaction of the receptors with their cargoes. The GTPase acts in concert with several cofactors. The striking property of Ran cofactors is that they are asymmetrically localized in the cell, with some predominantly cytoplasmic while others are predominantly found in the nucleus. This asymmetry helps to control the two-way transport between nucleus and cytoplasm. Mattaj, I. W., and L. Englmeier. "Nucleocytoplasmic Transport: The Soluble Phase." Annual Review of Biochemistry (1998) 67: 265-306. Nakielny, S., and G. Dreyfuss. "Transport of Proteins and RNAs in and Out of the Nucleus." Cell (1999) 99: 677-690.